In golf, every yard counts when it comes to hitting long to short shots. In putting, its all about feet and slope. Back when golf was first new, players sometimes had their caddies walk the courses before a match to get exact distances while in the dark. A pro golfers know the importance of getting correct distances to either clinch the top spot or maintain a lead in a tournament. But for your everyday golfer who just likes to play a nice, casual 18 there isn’t that level of dedication in most circumstances. If I were to go out and play, I would just have to use markers set on the course and guess as to what yardage it might be. Not too long ago someone got tired of trying to go through all of the tedious steps of calculating distances and adapted a tool that many use today. From naval warfare to forestry to landscaping, “rangefinders” have made calculating distances in a flash a cinch. 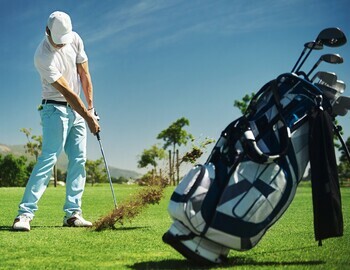 Golf has now adapted the technology to make finding the distance for golfers a breeze which in turn allows them to pick the perfect club for the next shot. Newer technology has allowed companies to even make watches that calculated distances for you as you approach your next shot. Rangefinders have made things easy on common golfers, but unfortunately USGA rulings forbid Pros and even some amateur tournaments from using them during rounds. So I suppose for now they are still going to have to rely on their caddies words.